Booklet: "Recorded on 4track equipment at The Hellfire Club, 16 nov 1980". "Thanks to Malcolm for clarinet". 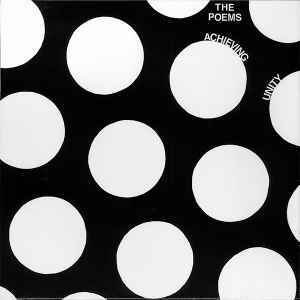 "Printed by Autonomy" (The Poems). "THE POEMS formed in the beginning of 1978 disillusioned with the way Punk had degenerated they wanted to play a music that continued the spirit of Punk but did not reiterate the musical forms. They could not play any instruments so it was decided that as Ian had a guitar he would play that Rose wanted to play drums and Drew decided to sing. All through 78 they tried out ideas and wrote songs until November of that year they played live. The audience was full of Punks who wanted punk music in its tried and tested form, the reaction wasn't bad just cold. In February 79 they recorded a track (POSTERS ON THE WALL) for a single called Alternative Paisley that summer they played an open air thing called Custom house Quay, with The Illegitimate sons of christ. It was good apart from the high glass content in the air. Their 3rd and last appearance was the most interesting some people loved it some got very hostile. The D.J. Kept trying to put the Disco on during the set the atmosphere was very tense. In February a cassette was recorded and was eventually released in July. This single was recorded in November. The reason they don't play much is that if you don't want play the Rock/Pub/University circuit in Glasgow there is nothing else but the situation won't always be so and in the next few months they will play a few times". The uncut booklet consists of 3 self-made inserts (1 spray painted cover and 2 double sided prints). Other: Durations are not listed on the release.